Bernie has kindly written the article below on their family, working life, retirement and the relationship they have had with our company since 1994. We greatly appreciate their contribution to Trade Secrets. It was a surprise to find out that Anne and I have been a clients of GFM since 1994 – time flies when you are having fun! 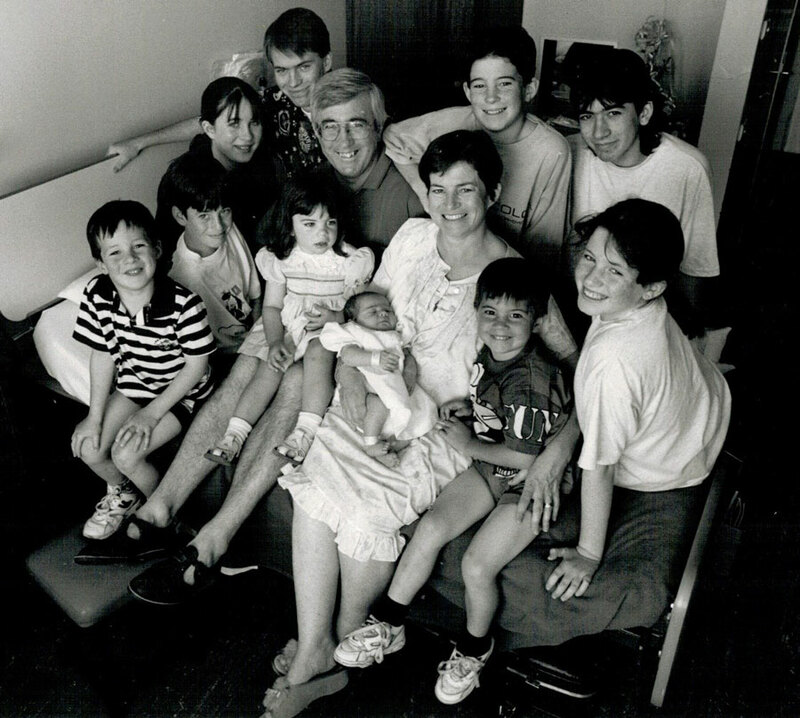 It was just a year after our youngest child Elizabeth was born amidst some publicity in the Herald Sun at the time as she joined her nine siblings to make an even ten – six boys and four girls with 18 years between the oldest and the youngest. I was fortunate with my career in employment and industrial relations initially with an association in the maritime and stevedoring industries and then as a practising lawyer at the firm Mallesons to be able to support Anne as a full time mother at home – life was never dull at home nor at work. I left the law firm in 2002 and joined the AFL Players’ Association as a legal consultant later that year having been involved with that Association in 1998/99 in the negotiation of a major Collective Bargaining Agreement. There was no lack of interesting matters to deal with at the Players’ Association. It was at the time of my retirement from Mallesons Stephen Jaques in 2002 that Paul greatly assisted us in the establishment of our SMSF in carefully and patiently working through all the details, addressing our initial concerns and making us comfortable with the choice we made. The result of their expert advice and continued strategic oversight has given us and the family opportunities that were never on our horizons when we started out in our married life. I have been able to retire and did that on 1st April, 2015 and we have been able to do some travelling to Canada, Europe, the Kimberley/Kakadu and Japan. Anne continues to share her child nurturing skills with our children and their partners and we also have the opportunity to spend time with our seven grandchildren. I have also been able to continue my involvement on the Boards of Assumption College Kilmore and the Essendon District Football League and with the local parish more recently in the planning for and building of the fourth primary school within the parish. These activities keeps the brain box ticking (I hope!) and with work on a developing vegetable garden, my involvement in these outlets gives Anne a bit more freedom around the house. We are working closely with Paul and Bree on our SMSF and the impending super reform changes. We have recommended GFM to our friends and know they are pleased both for the referral and for the advice received. We have also encouraged our children to use the services of GFM and a number have become clients in their own right which is extremely comforting to us. For Anne and I, GFM is part of our family and we feel very much at home when visiting the office or attending seminars. And whilst our focus has been on our family’s financial security, we are indeed very grateful for the assistance from GFM on a range of issues and in particular when Patrick assisted us in dealing with the minefield of nursing home bonds and pension entitlements for our elderly and now deceased mothers. We are enjoying this phase of our life and planning a return trip to Japan later this year and an overseas trip in 2018 (to fit within two family weddings next year). A photo of the family taken at the Mercy East Melbourne at the time our youngest was born in January 1993. The photo with an article appeared in the Herald Sun in early January, 1993 (Liz was born on 2 January – must have been some slow news days shortly after).